Home Shop News$20 Tattoos! July 3rd and 4th only! $20 Tattoos! July 3rd and 4th only! Feeling patriotic with an inclination to blow some things up? It’s nearly July 4th ~ so don’t worry, it’s happening to all of us. 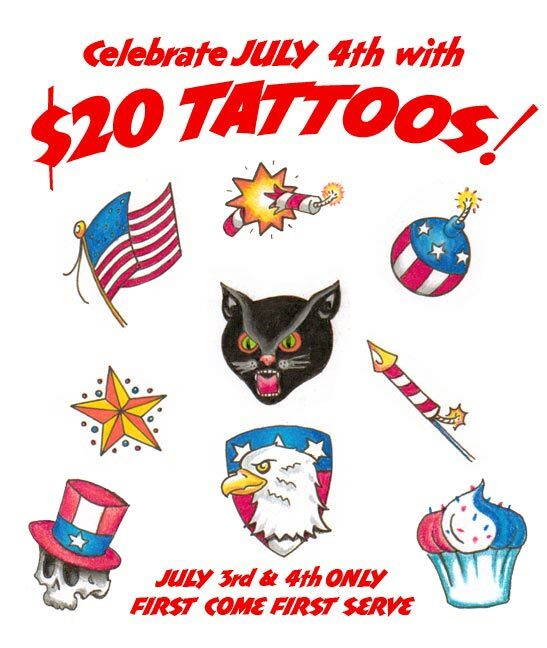 Thought it would be a good time to get folks in here for some quick and fun $20 tattoos to celebrate the holiday. July 3rd and 4th only. Request an appointment, or take your chances on a walk-in. Either way, we’re ready when you are! Between now and midnight Saturday, July 2nd, we’re taking suggestions for designs to include on the flash sheet. If we work up a design based on your idea – you get the tattoo free!! How’s that for a deal?! click here to contact us and make a design suggestion! Previous Previous post: Fresh shop pics! Next Next post: Thanks to all! Our July 4th special was a success!